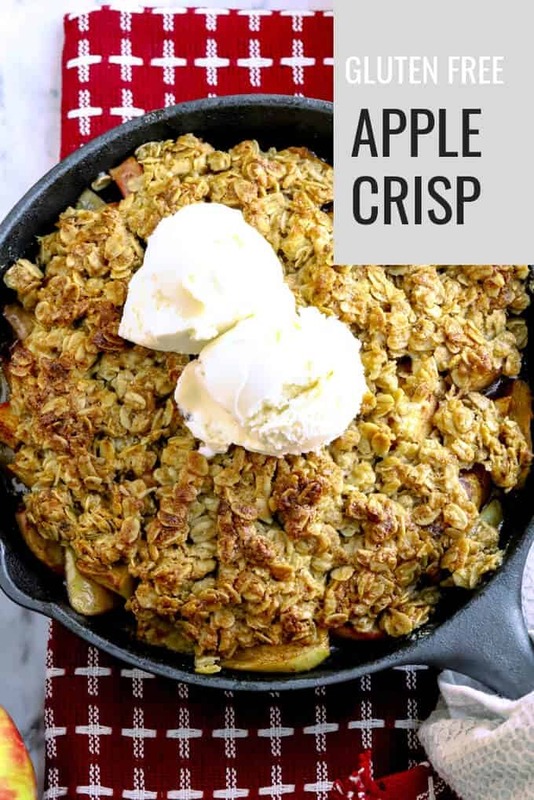 This recipe for Easy Apple Crisp takes autumn’s bounty of apples, tosses them with brown sugar and cinnamon, tops them with a gluten free oat topping, then bakes them in a cast iron skillet for a beautiful, homemade dessert. A gluten free apple crisp is always welcome fresh from the oven. If you bake this crisp ahead of time, warm it again in the oven for 20 minutes before serving. 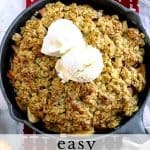 What makes this Easy Apple Crisp so SPECIAL? 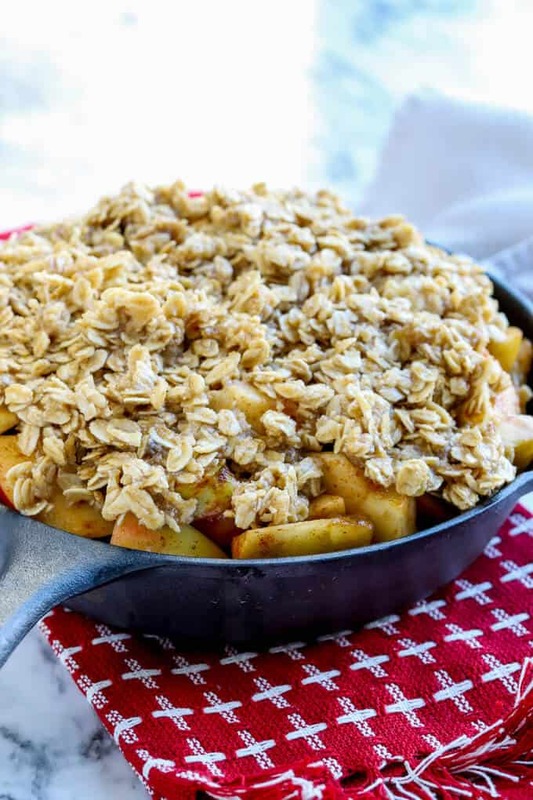 This gluten free apple crisp recipe has a simple ingredient list. Throw it together in a time crunch and love the results. A dessert that goes from its baking dish in the oven directly to the table is always a winner. A cast iron skillet gives you bonus points for presentation too. Servings are easy too: simply scoop out some of the apple filling with the topping and place it in a small bowl. Top with ice cream or caramel sauce (or both!). No fussy slicing or worrying about presentation. This easy apple crisp is a breeze to dish up. 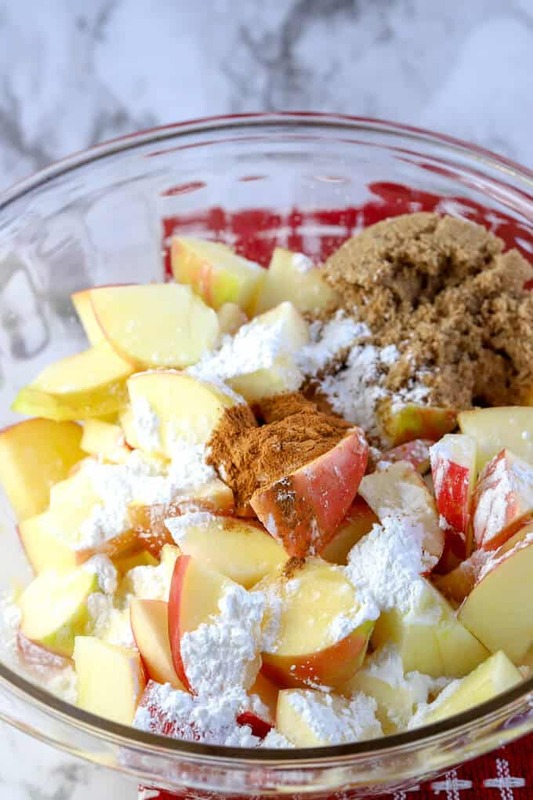 Make this gluten free apple crisp with almond flour. If you don’t require a gluten free diet, feel free to substitute traditional flour. What apple makes the best apple crisp? OK, this topic of the best apples for baking is always up for debate. First and foremost, use whatever apples you have on hand. It is hard to go wrong with a crisp recipe. 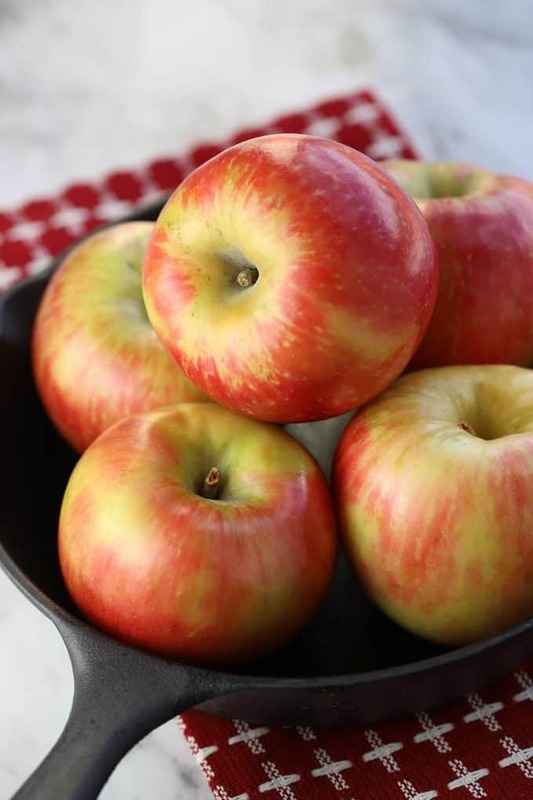 Honeycrisp will be your favorite– crunchy and bright, these apples are great for snacking and baking. Avoid a soft apple that will go mushy during baking. If soft apples are your only option, give it a try but know that the texture of the filling will be softer like applesauce. Not a bad thing, but maybe not ideal for an apple crisp. Start with the oat crisp topping so that the topping is waiting and ready to go as soon as your filling is done. Having your topping prepared ahead helps reduce the chances of your apples browning. Lemon juice helps slow down the browning but planning your time in the kitchen is a big part of baking this crisp successfully too. The topping ingredients used here are gluten free (double check that you are buying GF oats) but if you don’t need to prepare the crisp gluten free, you may switch the almond flour for all purpose flour. The almond flour lends its great texture to the dish so consider using it even if you’re not baking for a gluten free crowd. 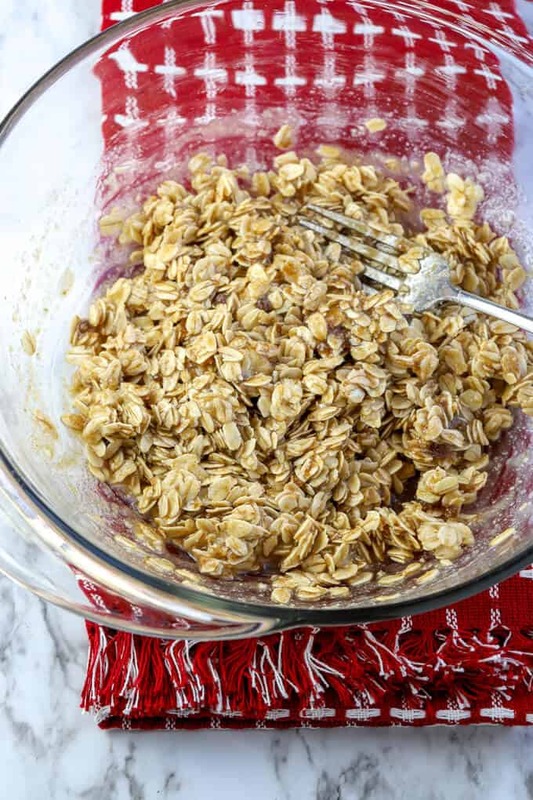 Simply toss these ingredients together with a fork or a spoon and set the oat topping aside. Now, let’s move on to the apple filling: apples, lemon juice (to prevent browning), brown sugar, cornstarch, and cinnamon. Gently toss the filling ingredients together then place in a cast iron skillet. A square, glass baking dish would suffice as well but the presentation of the cast iron skillet is my preference. Press the oat topping onto the apple filling. The topping can cover as much or as little of the filling as you’d like. This flexibility is another reason this gluten free apple crisp recipe is such as easy one. No fuss. If your topping reaches the edges of your baking dish, great, if not, no big deal. You’ll love it either way. 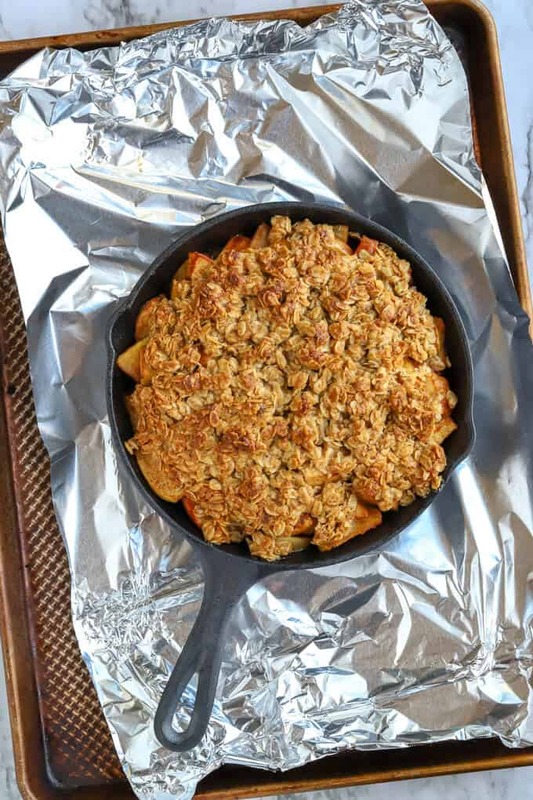 Place the apple crisp on a foil-lined baking try so that any juicy goodness that bubbles up and over won’t end up on the bottom of your oven. Cleaning your oven later will take the joy right out of baking! Bake at 350 degrees for 45-55 minutes or until the topping is brown and the filling is bubbling away. 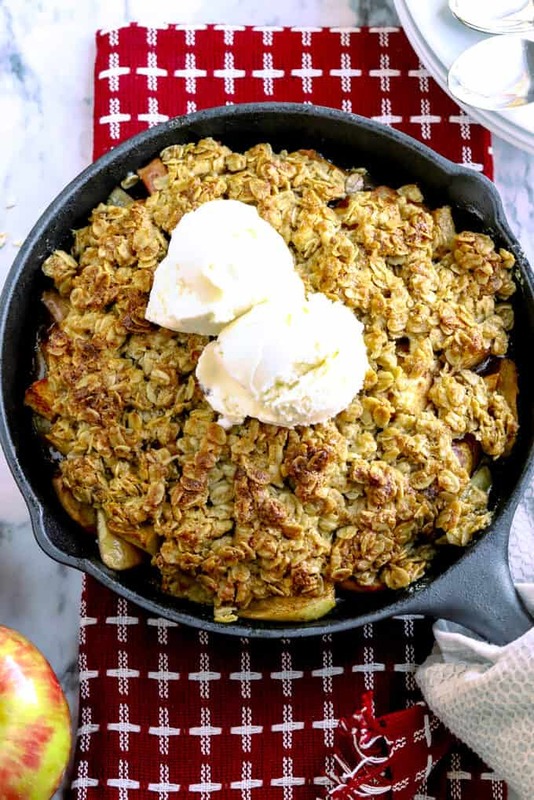 This easy apple crisp is a perfect choice for autumn. The recipe feeds 6-8 people and can be doubled in a larger skillet if needed. Top the apple crisp with vanilla ice cream– caramel sauce might take it over the top, give it a try! Now on to cleaning up that cast iron pan! Read tips and tricks for keeping your cast iron clean and functioning for years to come on this popular post. Apple Crisp is an easy dessert that takes so little time to pull together. You'll have this crisp going from your oven to the dessert table in no time at all! Preheat the oven to 350 degrees F. Cover a baking sheet with aluminum foil. 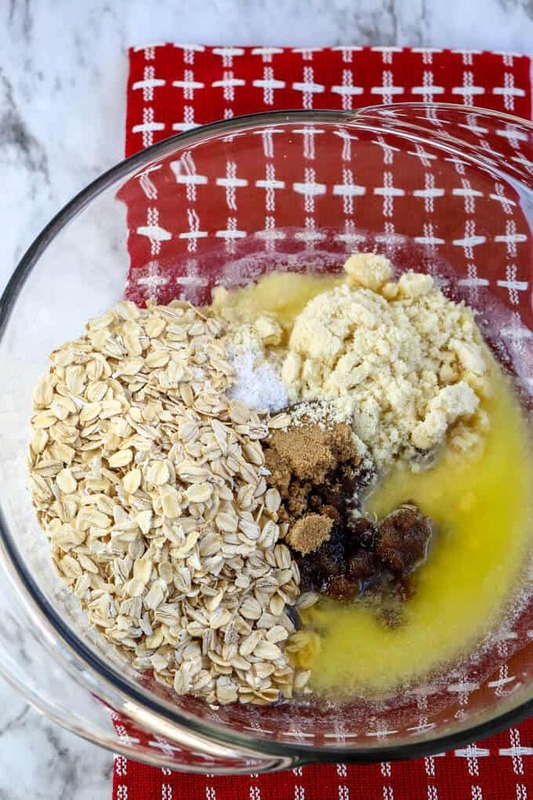 Prepare the topping first: Combine the gluten free oats, brown sugar, almond flour, melted butter and salt. Stir to combine. Set aside. Prepare the apple filling: Slice the apples in half, remove the core and stem, slice into thin slices (about 8 per half for a total of 16 per apple. Place in a glass bowl. Toss with the lemon juice to prevent browning. Add the 1/4 cup brown sugar, 1 tablespoon cornstarch and 1 teaspoon cinnamon. Toss to combine. Place the apple filling in an 8 inch cast iron skillet. Cover the filling with the oat topping. Bake at 350 for 44-55 minutes or until the topping is brown and the filling is bubbling. Serve as is or with vanilla ice cream. Check to make sure your oats and cornstarch are gluten free if you need to make this dessert gluten free. 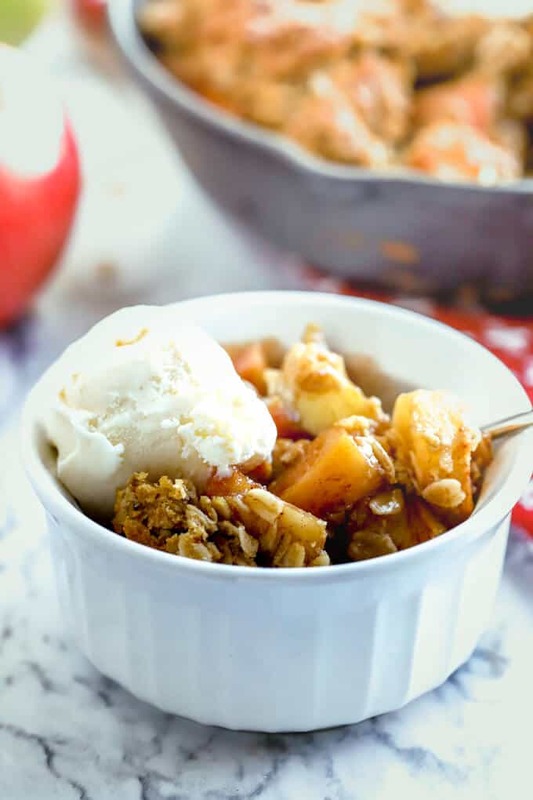 Pin this gluten free easy apple crisp with me! I LOVE apple crisp. This looks so good. Thanks! I wish I could go apple picking this weekend to have apples right from the Orchard but for this crisp, the apples from the grocery store worked just fine too. I’ve been craving apple crisp for days. The perfect fall treat! 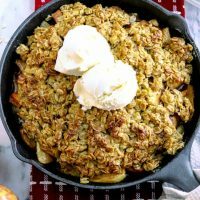 I hope you find time to make this apple crisp soon– one of my favorite desserts! I love this idea! It looks so delicious! Also your photos are beautiful! Thanks for the recipe and inspiration! Thanks, Caitlyn, for your kind comment. Have a great weekend! Thanks for your kind comment and for pinning too! I agree, such a great dessert with nearly any type of fruit. 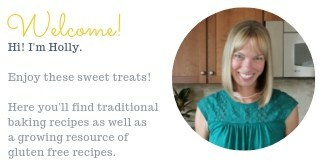 I know exactly what I’m making for dessert tonight!!! 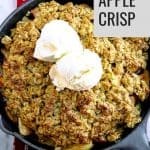 I LOVE apple crisp, it’s my favourite fall and winter dessert! this looks so crunchy and delicious! 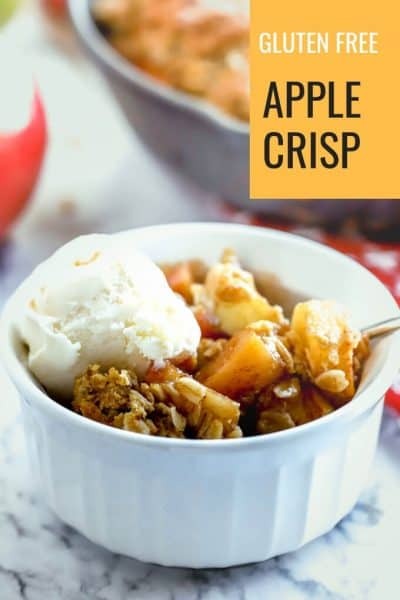 I’m ready for all the spiced apple recipes right now and I love that this apple crisp is gluten-free. A definite win for me! Yes! I am all about easy desserts and this is one of my favorite apple treats.